We had a bumper wildflower season this year, stay tuned for updates on the 2019 season. You can also keep up to date with what’s flowering in Australia’s Golden Outback region. If you find any flowers before we do let us know through Facebook. You can also email information and photos to [email protected] or phone us on local call 1300 736 283. Please provide your name and if known, the botanical name of the wildflowers in your image/s. Sharing you short videos of significant wildflower displays are encouraged with information of location and species if known. We rely on your information to keep our information up-to-date. Tour 1 Merredin Peak – Tour Days Fri, Sat & Sun 8:30am start from visitor centre, duration 2 hours with moderate granite rock walking. Cost – Adult $70, Senior $55, Children (17 and under) $40 and Family of 4 $200. Situated 8km north of Narembeen lies the Wadderin Wildlife Sanctuary. Take a night tour with Brendon to learn about the sanctuary and the flora and endangered wildlife. The sanctuary will in time become a haven for the protection of native fauna. Duration: 1.5 hours, between 6pm and 8pm. Brendan will arrange a meeting place at time of booking. For information on likely areas for wildflower exploring throughout the region during the spring months click on the locations below. The notes under each town indicate what flowers are likely to be out, where to find them and when to find them. They can be used as a guide only according to the specific 2018 seasonal conditions which are updated above. Beacon is the most north-easterly town in the Wheatbelt, adjacent to extensive native bushland and pastoral country. In normal seasons opening rains set the district up for a brilliant display of wildflowers from June to October including masses of white, pink and yellow everlastings, up to 20 varieties of orchids and many bigger trees and shrubs such as wattles, melaleuca, hakea, grevillea, and climbing clematis vines. A wildflower drive along the east shoreline of Lake Moore on Remlap Station will reveal masses everlastings. Nearby can be found numerous spider, blue and greenhood orchids. Mouroubra Road, 22 kilometres along the Bonnie Rock-Burakin Road, is a picturesque alternative route to Paynes Find, passing Remlap Station. It winds its way through a glorious display of colour if the everlastings are out while you enjoy the panorama of Lake Moore and the startling transition from wheatlands to pastoral country. Bruce Rock, 244 kilometres from Perth has a wildflower drive, an amphiteatre and native gardens for the viewing of flora. The flowers on view include isopogons, tinsel flowers, gastrolobiums, spider orchids, verticordias and triggerplants. The stunning scenery includes brilliant salmon gum-gimlet woodlands, granite outcrop, sandalwood and hakea areas. Other areas in Bruce Rock shire include Babakin, home of the rare underground orchid, and Ardath with its local nursery and heritage hotel. Kokerbin Hill, near Shackleton, has spectacular views of the countryside and a picnic area. The base of the granite rock is an ideal location for wildflowers and you can walk to the lookout. For further information call the Shire of Bruce Rock +61 8 9061 1377. The Shire of Corrigin has a wildflower drive which is just off the main Brookton Highway on the way into the town opposite the Dog Cemetery. Some of the wildflowers available to see in the district are painted feather flower, wild foxglove, blue squill, red toothbrush grevillea, purple enamel orchids, triggerplants, phebalium, cowslip orchids, everlastings, cone flower and many more. Spring is the best time to see the wildflowers and they usually flower for a few months. Contact the Shire of Corrigin on +61 8 9063 2203. Dowerin has several reserves within the Shire boundaries which are home to an array of wildflowers and native bush and are abundant with wildlife. Most wildflowers can be observed between July and October but as wildflowers are heavily dependent on the amount of rain that has fallen during winter, so the more rain, the more wildflowers there are to enjoy. Hot spots include the Tin Dog Creek Reserve, Namelcatchem Reserve and Minnivale Reserve. Some orchid species that have been spotted include the Donkey, Bunny, Leek and Spider. Many species of flowering wattles, grevillea and hakea can be seen on road verges and throughout the reserves in Dowerin. The striking Blue Dampiera, named after William Dampier who landed on the west coast of Australia in 1699, is also common on roadsides and in Reserves. Pink, white and yellow everlastings can sometimes form a carpet of colour in late August through to October. The rare Sandpaper Wattle can be seen at the Dowerin Rare Flora Garden in the Town Centre (next to the public toilets), as well as Daviesia euphorbioides or Wongan Cactus, Microcorys eremophiloides or Wongan Microcorys and Wongan conostylis. With good autumn rains spectacular wildflowers are in abundance across the Shire of Kondinin during September and October. Blankets of everlastings and a selection of orchids can be seen in many of the nature reserves. Larger flowering shrubs and acacias are fairly unaffected by rainfall and add to the vibrancy and diversity of the bushland in the region during springtime. Yeerakine Rock is well worth a visit and is just 12km from the Kondinin town site on the way out to Wave Rock. Take one of the two walk trails with interpretative panels and wander through Sheoak woodland (Allocasuarina huegeliana) with Jam (Aacia acuminata), interspersed by Sandalwood (Santalum spicatum) and Tee tree (Leptospermum species) which changes heading north as the landscape rises through eucalypt woodland and mallee, to tammar scrub with many spring flowering shrubs (Hibbertia, Melaleuca, Isopogon). During September and October some of the wildflowers to look out for include the Donkey Orchid (Diuris Corymbosa) and the Pink Candy Orchid (Caledenia) as well as the Broom Milkwort (Comesperma Scoparium). To help you identify the various species a booklet has been prepared that you can collect from the Kondinin Shire Office or the Kondinin Community Resource Centre, both located in Gordon Street, Kondinin. As you drive east towards Wave Rock, other spots to view an abundance of wildflowers include Karlgarin Hills Reserve and Mc Canns Rock Reserve. McCanns Rock has a great picnic/BBQ area surrounded by Sheoak, Acacia and many spring flowering shrub species. Karlgarin Hills has expanses of woodlands, Gimlet (Euc salubris), Salmon gum (Euc salmonophloia), Morrel (Euc longicornis) interspersed with melaleuca thickets and rocky outcrops. Arriving in Hyden take the walking circuit around Wave Rock and along to Hippos Yawn and you will also see a variety of wildflowers during September and October, including Sheoak (Allocasuarina huegeliana), Jam (Acacia acuminata), everlastings and several species of orchids. You can also book a Wildflower Tour around Hyden by visiting the Wildflower Shoppe at Wave Rock or by phoning (08) 9880 5182. Head out from Wave Rock towards the Humps and Mulka’s Cave and you will pass through various melaleuca species. Everlastings, orchids and many other small shrubs flower in spring. Out at the Humps the interpretive panels provide a great walk over The Humps and past a population of Gungurru, (Eucalyptus caesia ssp caesia, priority 4 rare flora), spectacular with weeping branches, miniritchie bark and pink flowers in winter. Other walks pass through Jam, Melaleuca and Sheoak thickets to a Gnamma. If you are heading onto Norseman get on the Granite Woodlands Discovery Trail which takes you through the Greater Western Woodlands where you will find an array of wildflowers at the designated stopovers along the way. Kulin is 283 kilometres south-east of Perth and the shire encompasses the towns of Kulin, Pingaring, Jitarning, and Holt Rock. En route to Wave Rock, Buckley’s Breakaway is a picturesque landform where erosion has cut through the orange laterite and formed spectacular white cliffs and gullies from the underlying clay. The gully is dominated by cypress pine, blue mallee and box poison, but it is the top of the breakaway which has the most interesting plants. It’s a natural garden, with something in flower year-round. There is a profusion of golden dryandras, soft pink petrophiles, pink and yellow verticordias, blue dampiera and many others. In the shelter of the shrubs look for delicate orchids, triggerplants and sundews. Buckley’s is 70 kilometres east of Kulin, off the Holt Rock Road. On the same road but 20 kilometres east of Kulin (follow the Tin Horse Highway), there is a shady picnic spot at the base of Jilakin Rock. An easy climb to the top of the rock provides spectacular views of Jilakin Lake and the surrounding wheatbelt. Wildflowers form a wonderful display when the season is good. Jilakin Rock has the most isolated known stand of Jarrah (150 kilometres from the main Jarrah belt), surviving on the water run-off and quality soils at the base of the rock. Kulin shire has an abundance of wildflower reserves. Hopkins Nature Reserve comes to life in the early spring and is an extremely important flora conservation area. North Jitarning Nature Reserve has a picnic area and is perfect to walk through and experience many different vegetation areas. Roadside flora is also abundant. Contact the Kulin Resource Centre on +61 8 9880 1021 for more information. The Macrocarpa Trail adjacent the townsite offers an easy walking trail through interesting bushland. Wildflowers bloom well in the area, which is three hours from Perth. August to October is a good time to see many species of shrubs in flower and orchids if the winter has been kind. In the Merredin townsite, reserves such as Tamma Parkland and Merredin Peak are worth exploring. Hakea and wattle species, tea trees and hibbertia are some species that put on a show. These look beautiful under the tall salmon gums and morrel trees. Wheatbelt woodlands have some of the greatest diversity of plants of any habitat in the State. Around the numerous granite rock outcrops in the southern section of the Merredin shire the shrubs are blooming. Patches of everlastings and understorey shrub displays make rocks such as Mt Moore,Totadgin, Elachbutting, Sandford and Baladjie worth a visit. Contact the Central Wheatbelt Visitor Centre for more information on +61 8 9041 1666. The Shire of Mt Marshall is within the north-eastern Wheatbelt, 273 kilometres from Perth. It is made up of both pastoral and cropping country and has numerous granite outcrops and nature reserves that put on a magnificent wildflower display given good seasonal conditions. The shire includes the towns of Bencubbin and Beacon. Wattles, foxgloves, grevillea, hakea, bottlebrush, milkwort, pompoms, everlastings and some orchids may be seen around the rocky outcrops (snail, spider and donkey orchids). One great drive follows Bimbijy Road, where you can travel through the pastoral country and take in excellent views of the district from Mt Churchman. Another interesting drive is Mouroubra Road Walong which you can travel north through the Shire to Payne’s Find and the Great Northern Highway. Please note, if you plan on driving Mouroubra Rd please give the Shire of Mt Marshall a call beforehand to check road conditions. Maps of the district and tourist drives are available from the Bencubbin Community Resource Centre, Beacon Resource Centre or contact the Shire of Mt Marshall on +61 8 9685 1202. Acacias are a feature around the granite rocks. Calothamnus quadrifidus provides a great display of red one-sided flowers and as does Leptospermum erubescens with its show of pink and white. If you keep your eyes open you may see the upside down pea bush with red flowers. Elachbutting rock and the many other granite rocks will be well worth a visit with salmon gum and mallee, colourful understorey and spectacular rock formations. Roadsides from Echo Valley Road in the east of the shire to the Mukinbudin-Bencubbin Road in the west will have their share of the light land species such as hakeas, grevilleas, dampieras, thryptomenes, Pityrodia terminalis (native foxgloves) and Hemiphora elderii (red velvet), Keraudrenia integrifolia (firebush) and later the verticordias (feather flowers) in pinks, yellows and whites. Travel through Narembeen either as part of a Wave Rock tour or as an alternative to the Great Eastern Highway on your way to Kalgoorlie. 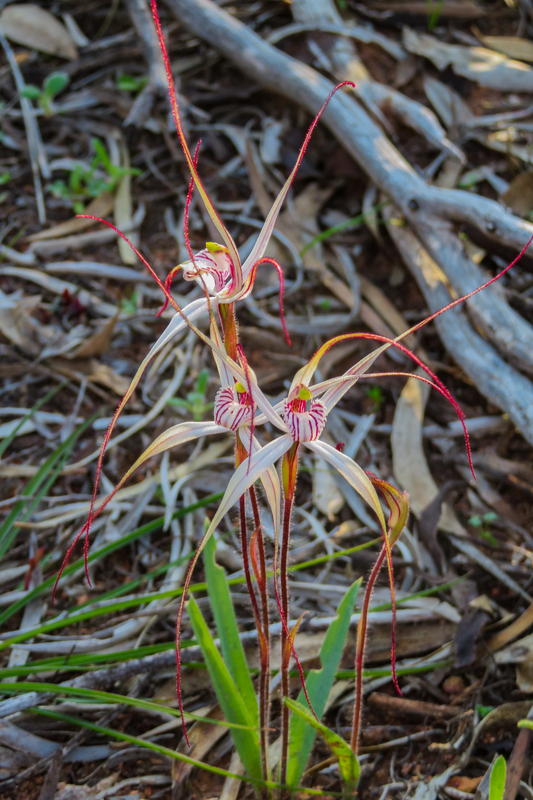 On the Hyden-Mt Walker-Narembeen Road, stop at Hidden Hollow where you may find orchids, eremophilas and other wildflowers. On the Narembeen-Merredin Road, right through to Belka, there are a huge array of shrubs and wildflowers on the roadside – cyanostegia, grevilleas, hakeas, sandalwood, keraudrinia, glischrocaryon and dampiera. There is a bush walk near the Narembeen Golf Club and visitors can combine a game of golf and bushwalk. Tours are available of Wadderin Reserve. Contact Brendon Johns +61 428 647 877. Quairading is 167 kms east of Perth along the York to Bruce Rock Road and is in the heart of the Wheatbelt producing mainly cereal grains but also very active with many stud sheep breeders and one very famous Red Poll Stud, Yongerellen and the district has been very successful in the Royal Show arena with many Governor’s Cups coming home to Quairading through the Squires family. The district is also unique in that it is one of the few areas in the world that has the Banksia Cuneata (Matchstick Banksia) and the Hakea Aculeata (Proteaceae), a very rare plant. The jewel in the crown for Quairading is the Quairading Community Nature Reserve, 527 hectares of unique remnant vegetation that includes a diverse mixture of woodland forest and native shrub land. The open woodland areas of the Reserve have outstanding examples of Wandoo, York and Salmon Gum forests that are unique in the Central Wheatbelt. Other areas of interest around Quairading (and also catering to wildflower enthusiasts) are the Reserve on the eastern end of the town site; Toapin Weir; Pink Lake and the Rabbit Proof Fence Gazebo on the Quairading Corrigin Road. This gazebo, alongside parts of the original Rabbit Proof Fence, also tells the story of the Stacey Lamb Train, which became a household phrase during the 40’s to the 70’s. For a wonderful view of our wildflowers, it is best to drive along the Emu Fence Road from Hyden to Marvel Loch and out to the Great Eastern Highway, near Yellowdine. Along the Southern Cross South Road, a must-see is the Southern Cross Common. Corinthia, Forrestania and South Nulla Nulla roads will all have a show of hakeas (emu tree), camel bush, flannel bush, eremophila, dampiera and common firebush. For Golden Pipeline travellers, there will be spider orchids under jam trees (in a good season), many feather flowers, short paper lilies on the sandplain and golden grevillea along the highway. Our granite rocks are rich with orchids from July to November, given a good season, with snail orchids starting the rush. The Orchids are soon to come out to enjoy the sunshine. The Wheatbelt region blooms to life with dashes of colours throughout the season, which typically lasts between July and October with an abundance of Orchids and Everlastings across the Wheatbelt, plus more. There are more than 12,000 species of wildflowers in WA, making it the world’s largest collection. It’s a staggering sight to behold, especially when you consider 60% of Western Australian wildflowers are found nowhere else on Earth. What’s more, you can enjoy their glorious carpets of colour and curious blooms. Just outside the entrance to the caravan park you will find the start of the Woodlands and Wildflowers Heritage Walk Trail. This 4km walk trail will take you through the Westonia Common woodland and back to town past historic points of interest. Keep an eye out for wildflowers in season. Contact the Shire of Westonia on +61 8 9046 7063 for further information. Korrelocking Reserve, about 10 kilometres from Wyalkatchem townsite, has a variety of orchids on the west side of the reserve given a good season. Wyalkatchem Nature Reserve is worth having a look at to see what is flowering. The Wyalkatchem Walk-A-Wyal trail is a walk trail consisting of three different tracks, 2.4kms, 3kms and 5.5kms. As you walk along the trails keep an eye out for the many species of orchids which includes the donkey orchid and two varieties of spider orchids. The walk trail is dotted with pink and white everlastings which are native to the Wheatbelt. Contact the Wyalkatchem CRC +61 8 9681 1500 for more information.